Right in front of his wife because he learned she was sleeping with someone else. Just a few months ago, she gave birth to his third son. It feels so unfair to love someone when they don’t love you back. You want so badly to settle the score. To balance the scales. To make the pain go away. A dramatic act of violence in front of his wife who’d rejected him seemed the most-effective way to even things out. Taking his own life seemed the most-effective way to make the pain go away. Pulling the trigger seemed the most-effective methodology. He was a man who grew up surrounded by crime and poverty. Death and violence are interwoven into most stories that begin there. Despite overcoming enormous odds and achieving financial success and settling into family life, death and violence are what he knew. He died yesterday from a self-inflicted gunshot wound intended to eliminate his pain, and as an unforgettable goodbye note to his wife. 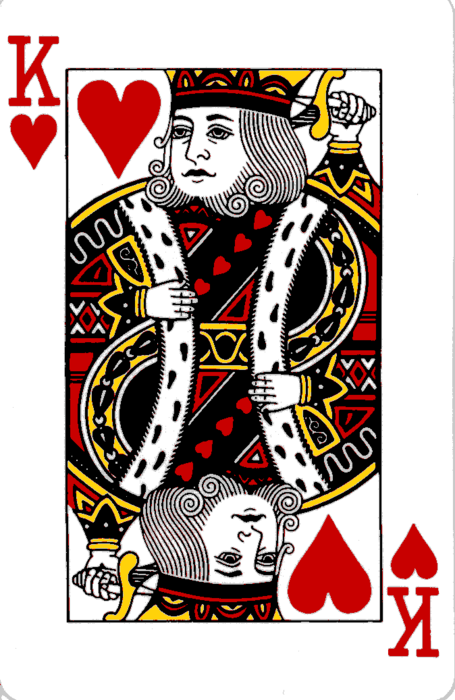 People sometimes call the King of Hearts in a deck of playing cards “The Suicide Kings.” Because they appear to be stabbing themselves in the head with their swords. There’s no blood. It’s not a violent image. So maybe the artist meant to show a brave king wielding a sword behind his head, preparing to strike an enemy. Or maybe it’s designed to evoke images of a sad, lonely man considering taking his own life, but unwilling to do so. Maybe the heart has something to do with it. All we really have in life are the people we love and care about, and the people who love and care about us. That’s why it’s so hard for many people to move far away from home. Our roots are important to us. They provide sure footing during uncertain times. And when we’re away—disconnected—and facing life’s inevitable hardships, we can feel lost at sea without that anchor of comfort and familiarity. We can feel isolated, lonely and lost when we don’t have, or are far away from, home. Because home is what we know. I don’t think we ever lose the natural instinct to run into our parents’ arms when we’re hurt and want someone else to make it better for us. It becomes more of a metaphor as an adult. But our human instinct to crave comfort and reassurance remains. The hard times—particularly the first ones we experience as people—feel REALLY hard. I often use the word “dying” to describe it. It feels like how I imagine dying to feel. Maybe worse. There’s a difference between the pain we feel in a physical sense—like a flesh wound or bone break—and the pain we feel when something happens to us internally. When we break on the inside. They don’t make painkillers for broken hearts. For poisoned minds. For torn souls. Your entire body is tense, aching, and you feel like a prisoner inside it because there’s nowhere to run and hide. And when it happens for the first time, it’s the most-frightening thing that’s ever happened to us because we didn’t know our bodies were capable of feeling like that. What if I never feel like me again? Is this how it’s going to be for the rest of my life? I didn’t know it was possible to hurt this much. Only in that moment can a person understand why another human being could take their own life. You can’t know until you know. I didn’t know how common this reaction to a life hardship was until I was feeling it myself. When you go through difficult times, other people sometimes are more willing to open up about their hard times. Sometimes, those talks can help both people heal a little more. I’ve talked to SO MANY people going through challenging times over the past couple years. Divorce and broken families are the most common. But sometimes people died. Sometimes people’s children were suffering in extreme and unimaginable ways. My friend texted me about yesterday’s suicide. She was shocked and devastated to lose someone she talked to and worked with every day. She was asking so many questions. “I keep thinking… ‘What if Matt had done that?’,” she said, drawing parallels between how her now-departed friend was feeling relative to how I was feeling 18 months ago. I remember driving by the hospital where my wife met the other guy. Sometimes, I had to drive by on my way to the office. Tears fell more often than I care to admit. My insides twisted. And I couldn’t escape. And I’d think: Would it really be so bad if I just went head-on into that massive concrete Interstate pillar? Do I really care whether I wake up tomorrow? It’s the closest to suicidal I’d ever been and ever hope to be. It’s scary to understand that. I spent my entire life not understanding how someone could ever want to kill themselves, and I’m confident in reporting that it’s infinitely better when you’re too innocent, happy and ignorant to understand it. The truth is, I didn’t want to die. But I felt like I’d exceeded my pain threshold. And all I wanted to do was make it go away. I couldn’t function in any area of life, making the entire exercise seem somewhat moot. “Why does one person shoot himself and the other start a blog?,” she said. “I know why. It’s what they know. He grew up in the slums. He knows violence. Guns. A lot of gun death. Why did that man kill himself when I wouldn’t? Is it because I don’t know gun violence? Maybe. But I don’t think so. I don’t know. But I do know some things. I know life is precious. I know good conquers evil. I know happy is better than sad. I know happy is good. I know there are billions of people who would gladly trade lives with me right this second if they could because they believe I have it so good. I know we have purpose and it’s our job to seek it. I know I love. Deeply. My son. Life. You. I know every day I wake up could be the best day of my life, and sooner or later, that day is going to come, and I choose to look forward to it. I know I have a choice: Despair. Or, hope. And I choose courage. I choose love. I choose hope. That’s why I’m still breathing. That’s why I started writing. And that’s why I’ll keep trying to do both for as long as I possibly can. So, know it: The sun will rise tomorrow. Everything’s going to be okay. Without the low, there ain’t a high. Wow, I feel so influential now. I basically said the same thing about the song…and then a whole bunch of other stuff. Is your ex still with the other man? Do you and him get along? No. That relationship ended, which began the healing process for me. I can’t know for sure, but I don’t think I’d be in a good place if that was still a thing. My perspective is so much different now. I’m so much different now. Then, I was so upset and surprised by everything and my son was in the middle, that I felt like it was all very much my business. It’s a year and a half later. It’s very much not my business, now. I’m confident I won’t be thrilled to be best friends with whoever a future partner might be there. But I’ll try my hardest to be kind and respectful. I see no point in behaving otherwise. I totally see where you’re coming from, and I would personally be rejoicing that it ended if it were me. But it also makes me feel “well, that wrecked a family for nothing”. I really hope (for your sons sake most of all) that she regrets ending things the way she did. So futile. And I’m sorry if you feel I’m one of the “misery loves company” people. I just find that very few people really get it. It’s one of those things everyone thinks they know how you should feel but if they haven’t been through it very few can really get it. IF is a very big word. Some of us make positive choices and others, negative or less negative with our lives. It is sad when we learn of someone who was so desperate that they feel the only choice is to stop. I can’t even begin to understand. Some of us resort to blogging and others don’t – glad you did. One step at a time. One foot after the other. Not everyone who ends their life grew up knowing violence. My son (who thankfully failed his attempt) grew up knowing love. The others I have heard of through the past week (yes there has been more than one) were all well respected, creative, brave and loving individuals. But I hear you Matt. I have been there. I have had the thoughts that ending the pain or ridding others of my ‘useless’ self is the best option available. But like you, I had words. Thank goodness for words. Really needed this today, Matt. Thanks. Tomorrow may be the most amazing day. And the day after could be even better. Just one of your best posts yet. Because we can all relate. Because it’s both authentic and utterly universal. It’s beautifully written. We do what we know. Which is why every minute with your son is a beautiful, good thing. Because what he knows is you. Thank you for choosing hope. I know it wasn’t an easy decision, but it’s been worth it, hasn’t it? Did you know that this week is National Suicide Prevention Week? Sadly, for some, there will be nothing that will prevent them for attempting suicide. My father committed suicide in 1991, and his brother killed himself last year (both by gunshot). They did not grow up in crime and poverty, but did grow up in a highly dysfunctional family with a history of mental illness. I only recently found out that their mother (my grandmother) had attempted suicide at least a couple of times when she was a young woman. The completed suicide rate for men is 4 times higher for men because they are more likely to choose a firearm. What do I know as a survivor of suicide? That mental illness can be fatal. And that hopelessness and a feeling that it will never get better plays a huge role. Even on your darkest day, you had hope, somewhere deep inside. And you had a healthy way to cope and to try to make sense of your dark days. And while you try to make sense of this senseless act, the most important thing is to talk about it. Not to be afraid to say the word. Even to someone who is thinking about it. I encourage you (and everyone) to learn more about suicide. The American Foundation for Suicide Prevention (afsp.org) is an excellent place to start. Having lost friends to suicide, I get hopelessness. It infuriates me, there is always hope despite how heartbroken we might be, right now, today; there is always hope. Suicide, yes it signifies hopelessness, a terrible sense of loss. I am glad you chose hope, tomorrow and ultimately what you know, words. I’ve been depressed in my life. I’ve even toyed with suicide ideation, which is obsessively picturing the method in which I would commit suicide. But actually committing it? No possible way. No matter how bad it is, it has to be better than that nothingness that waits for us at the end. I’m not rushing towards that dirt nap any time soon. What a powerful post. Well done. Life is so good and this too shall pass. No matter how bad one feels in the moment, there is a brighter future ahead. It’s so hard for people in pain to hear that, to trust in it. I live in a part of the world where suicide rates are high, mostly men. I wish they could see how loved they were, how missed they are, how awful their loss has been for all those they left behind. They had worth and value in the world, people who cared about them, lives that will forever feel their absence. When people kill themselves they take a piece of us with them. Powerful words, beautiful post. I hope never go to that place again. Love the track. Thank you for sharing this experience with us, Matt. I wonder: What if knowing that one actually has a choice makes the difference? It did for me, though. Much love – and thank you for choosing life.